Mraz has won two Grammy Awards and received two additional nominations, and has also won two Teen Choice Awards, a People's Choice Award and the Hal David Songwriters Hall of Fame Award. He has earned Platinum and multi-Platinum certifications in over 20 countries, and has toured in North America, South America, Europe, Asia, Australia, the Middle East and parts of Africa. As of July 2014, Mraz has sold over seven million albums, and over 11.5 million downloaded singles. His musical style, from rhythmic feeling to his use of nylon string guitars, has been heavily influenced by Brazilian music. Mraz was born and raised in Mechanicsville, Virginia. He is of Czech and Slovak descent through his grandfather, who moved to the United States from Austria-Hungary in 1915. His surname is Czech for "frost". (Czech: mráz) His parents, Tom (Tomáš) Mraz and June, divorced when he was five years old, but he maintains that he had an idyllic childhood, saying, "My hometown of Mechanicsville was very American. There were white picket fences, a church on every street corner, low crime and virtually no drug use. It was a good place to grow up." After graduating from Lee-Davis High School, where he was a member of the cheerleading squad, Mraz attended the American Musical and Dramatic Academy in New York City for about a year and a half, before returning to Mechanicsville and taking on a series of odd jobs. He then enrolled at Longwood University in Farmville, Virginia, but instead of attending classes, headed west on a road trip that ultimately brought him to San Diego, where he decided to stay. In 2002, Mraz signed a recording contract with Elektra Records. That year saw the release of his first major label debut album, Waiting for My Rocket to Come, which peaked at number 55 on the Billboard 200. The lead single, "The Remedy (I Won't Worry)", was co-written by music production team The Matrix, and became Mraz's first top 10 single on the Billboard Hot 100, peaking at number 3, becoming one of the biggest songs of 2003. The song was inspired by a high school friend who was diagnosed with cancer. On May 19, 2005, Waiting for My Rocket to Come was certified Platinum, for selling 1 million units. 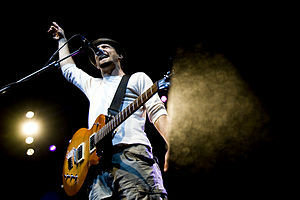 Mraz’s 2008 world tour took him all over the United States, Europe, Asia and Australia. His personal photo travelogue from the world tour was published as a book, titled A Thousand Things (2008). The book contains Polaroids from his time touring and backpacking around Europe, and was launched with a photo exhibition at Charles Cowles Gallery in New York City at the end of 2008. Also in 2008, Mraz played with Eric Clapton to a crowd of 45,000 in Hyde Park, London, sold out London's Royal Albert Hall and performed at the Nobel Peace Prize Concert in Oslo. That year also marked his Music, Magic & Make Peace Tour with Bushwalla, The Makepeace Brothers, and magician Justin Willman. Mraz brought along the magician after picking up magic as a hobby during recording sessions for We Sing. We Dance. We Steal Things. On January 31, 2009, Mraz was the musical guest on Saturday Night Live, performing "I'm Yours" and "Lucky",[unreliable source?] which peaked on the Hot 100 at number 82. Mraz's fifth studio album, Yes!, was released on July 15, 2014. It is his first acoustic album, and was recorded with folk rock all-girl band Raining Jane. 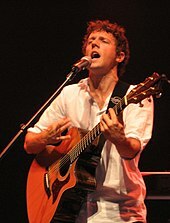 They had previously co-written "A Beautiful Mess" for Mraz's 2008 album We Sing. We Dance. We Steal Things. Aside from a cover of the Boyz II Men song "It's So Hard to Say Goodbye to Yesterday", every song on Yes! was written by Mraz and Raining Jane. The lead single, "Love Someone", was released on May 19, 2014, with Mraz performing an acoustic version of the song for Time. On June 20, 2014, he released We Can Take the Long Way, a music video trilogy for the first three songs on Yes! – "Love Someone", "Hello, You Beautiful Thing" and "Long Drive". It premiered on the USA Today website. Mraz lives a health-conscious lifestyle and has said that he eats mostly raw vegan foods. His vegan diet has also influenced his music. He owns a five-and-a-half acre avocado farm in Bonsall, California. He is an investor at Café Gratitude, a vegan restaurant in Los Angeles, and named his 2011 tour Gratitude Café in its honor. His hobbies include surfing, yoga and photography. On October 25, 2015, Mraz announced his secret marriage to girlfriend, Christina (Tina) Carano, in a post on his Facebook page. Mraz is a social activist whose philanthropic efforts span wide-ranging issues, including the environment, human rights and LGBT equality. In 2009, he participated in a rescue mission to Ghana with members of Free the Slaves, an international nonprofit working to liberate children sold into slavery. In 2012, he was featured as the first-ever straight man on the cover of Instinct magazine in recognition of his efforts in support of LGBT rights. On December 16, 2012, Mraz headlined the Milestone Concert in Myanmar to raise awareness about human trafficking, the first foreign artist to play an open-air concert in Myanmar. The concert was organized by MTV EXIT and held in the People's Square in Yangon, with over 70,000 people in attendance, as part of an initiative to raise awareness about human trafficking in Myanmar. Also in 2012, Mraz spent a week in Antarctica with a group of environmentalists, scientists and researchers on a mission led by Al Gore, to learn about the effects of climate change. ^ Rodgers, Jeffrey Pepper. "JASON MRAZ." Acoustic Guitar 10 2010: 48-53. ^ "Fast Facts: 48th Annual Grammy Nominees". Fox News. December 8, 2005. Retrieved July 1, 2007. ^ "Charts–''We Sing. We Dance. We Steal Things.''". Acharts.us. Retrieved 2012-08-19. ^ "Charts – "I'm Yours"". Acharts.us. 2008-08-12. Retrieved 2012-08-19. ^ "Jason Mraz to get Hal David Starlight Award". Songhall.org. 2009-04-14. Retrieved 2012-08-19. ^ a b Gary Trust, "Jason Mraz’s ‘I Won’t Give Up’ Storms Hot 100’s Top 10," Billboard, January 11, 2012. ^ "'Interview – Jason Mraz" audiophil.tv, June 23, 2014. ^ "Jason Mraz (2)". Vegetarianstar.com. Retrieved 2012-08-19. ^ Celebrity Ambassadors, VH1 Save the Music Foundation. Retrieved May 25, 2014. ^ "SPARC alum Jason Mraz performs benefit concert as grand finale of SPARC's 30th Anniversary". sparconline.org. 2012-12-08. Archived from the original on 2012-04-24. Retrieved 2012-12-08. ^ "Clean Water Awards Announced!" sandiego.surfrider.org. Retrieved May 25, 2014. ^ "Jason Mraz PSA for The Nature Conservancy," The Nature Conservancy. Retrieved Mary 25, 2014. ^ "70,000 Fans Attend MTV EXIT Live in Myanmar Featuring Jason Mraz". Archived from the original on 2013-07-04.